Will Tesla’s Demand Outstrip the Supply of This Key Commodity? 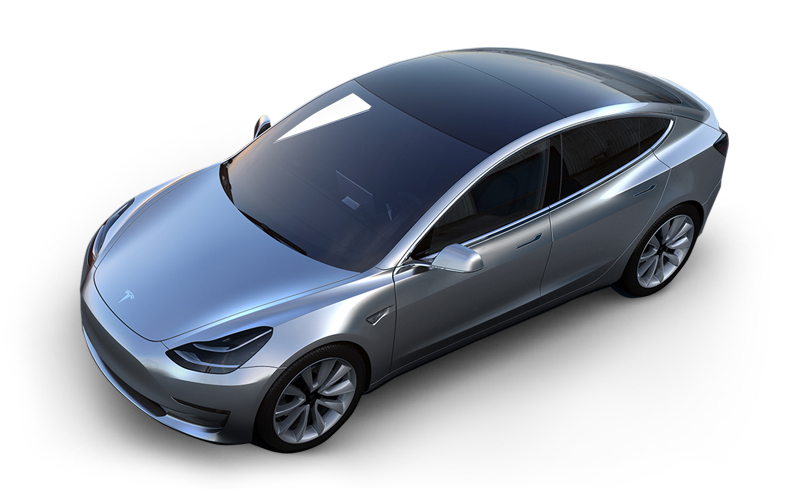 Tesla just pre-sold a whopping 325,000 Tesla Model 3s. Yup, excited buyers gave the company $325 million in an interest-free loan for a car they haven’t seen, or who’s factory still hasn’t been built yet. And it’s remarkable that a car company with no advertising, and no dealers can get people to stand in line for hours to buy a car that won’t be ready for over a year. Most of the people in line will have to wait 2 years, and probably won’t receive the $7,500 tax credit for electric cars either. The key component to the car is the battery. Tesla is still building the gigawatt battery plant in Nevada, and is expected to be a large consumer of global Lithium ion production. By the time Elon Musk’s prediction of rolling out 500,000 cars rolls around, it will most likely absorb the entire world’s annual Lithium production! 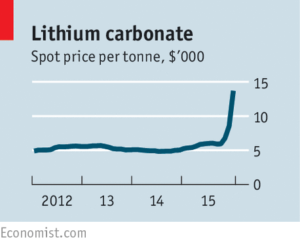 Unsurprisingly, prices for Lithium has soared, doubling this year. This chart from the Economist shows prices up 3 fold from the long-term average of $5,000 per tonne. There are also rumors out of China that prices might double again from here. If Tesla is absorbing the entire global production what are the other electric car manufacturers going to do, not to mention the makers of power tools, household appliances and rechargeable batteries, that all use Lithium ion as well. Sounds likes it’s time for a short-term speculation in Lithium exploration/production companies! While gambling on these sort of things rarely work out, if you’re so inclined, you might want to check out Global X’s Lithium ETF, which invests in the full lithium cycle, from mining and refining the metal, through battery production. The fund isn’t exactly cheap, with a 0.77% expense ratio, and it owns 25 different companies, with Tesla (TSLA) being one of them. Also, two companies consist of 28% of the fund – FMC Corp and Sociedad Quimica Y Minera De Chile (or The Chemical and Mining Company of Chile, cutely called SQM). According to Morningstar analysis, FMC is undervalued by about 20%, and SQM is overvalued by 25%. While valuations are highly subjective, Morningstar is a good quality resource at a cheap price. I’ll probably pass on this fund, despite the fact that it’s an interesting opportunity. This guest post comes from Kevin at 20smoney.com, a blog covering financial topics such as investing, money management and the development of income streams. Despite the fact that most people tend to think that a market that has already booked a 60%+ rally is a great time to be invested in stocks, I tend to lean the opposite direction. With such a massive run already in place, the risk/reward scenario is not nearly as good as it was when compared to earlier in the rally. So, how should you play the current environment? The sectors with some of the largest gains this year have been technology and financials. As such, these sectors warrant extreme caution if you are currently long or are getting long any companies within these sectors. If you want to be long the sector, but aren’t sure of specific stocks, consider mutual funds or ETFs such as Financial Select Spider (XLF) and Technology Spider (XLK). If you’re looking to gain exposure in these sectors, I strongly encourage you to monitor some basic technical signals so that you can identify a clear exit point in case the broad market and/or these sectors reverse and head lower. Watch the 20 and 50 day moving averages. If the stock (or ETF) breaks through these key averages, be ready to exit the position. If you don’t feel comfortable with such a strategy and want to take a more long term focus, I would then wait for a significant pullback, at least 5%, to enter your position. Remember, you’ve already missed a large run in stocks, and you need to be careful entering a position at these levels. If you have held stocks this year, especially in the sectors named above, you may consider actually selling some of your positions to lock in profits. Taking profits is never a bad idea, and if you don’t want to pull out completely, simply sell half or maybe a third of your position. If you are looking to enter other long term positions, I would point you towards dividend paying companies that will pay you to hold them. This will help offset any losses in share price if there is a reversal in the markets. Also consider multi-national companies that generate a significant portion of their earnings from abroad (this will help you hedge against weakness in the U.S. economy). In this category, consider Philip Morris International (PM), Wal-Mart (WMT), McDonalds (MCD) and perhaps Microsoft (MSFT). For me personally, I’m pretty bearish on the economy and the markets. I’m skeptical on the strength and durability of the recovery and the stock market rally. I believe that we have structural issues with our economy that have not been addressed and therefore will prevent real growth. I’m not adding to any positions in the current environment, rather I’m “keeping my powder dry” waiting for much more attractive buying opportunities. I do own gold related instruments such as GLD and GDX because I think gold has the potential to perform well in both an inflationary recovery and a deflationary environment (pretty much the only asset with this ability). As I mentioned above, if you’re looking to try and make a few bucks on the continued rally in the broad markets, be extra careful and be ready to exit by monitoring some key technical sell indicators. Protecting your money is a better strategy, in my opinion, than chasing returns, especially today. If you’re a long term believer in the recovery and the future of the economy, get long some solid companies, but don’t be afraid to be patient and wait for better entry points. Which Dividend Stocks Are Worth Looking At? The market has been defying gravity this summer, with the S&P500 up 49% since March. But most of the appreciation has been in what I consider lower quality stocks. Many homebuilders with doubtful prospects have doubled from their recent lows, while stocks that are somewhat recession proof like McDonalds, Walmart, Coca-Cola and Procter & Gamble have bounced a mere 15-20%. According to Bloomberg, “companies with the worst earnings led the 45 percent gain in the Standard & Poor’s 500 Index since it fell to a 12-year low five months ago”. It might be a good time to sell some of your winners that have exceptionally well and either wait for a pull-back, or if you’re trigger happy, buy solid investment-grade companies. Given the current economic environment with the US Dollar likely to devalue against foreign currencies and the high probability of inflation, you want to invest in a company with exposure to foreign markets, a stable business model that is non-cyclical and a history of growing dividends. You also want to avoid luxury brands or businesses that sell expensive goods. Here are a few of the companies that I would consider looking at, along with their dividend yields. If you are going to buy currency ETFs or currencies you might want to also check out some of the risk-free currency CDs offered by Everbank. At the very least, definitely subscribe to their free newsletter, the Daily Pfennig. It’s quite informative and very interesting. ETFconnect.com is a great site to find out more information about ETFs. Having some exposure to foreign currency and gold miners isn’t a bad idea. I’ve been worrying about the effects of the Federal Reserve printing money like its going out of style and the CEO of Coeur d’Alene (CDE), a silver mining company that I happen to own, predicts that Silver will jump 29% by the end of the year because of this. Demand from investors seeking a store of wealth accounts for more than half of silver’s 23 percent price jump this year before today, Wheeler said in an interview in New York. The metal will reach $18 an ounce with supplies little changed and demand buoyed by purchases from exchange-traded funds, he said. The U.S. government has pledged $12.8 trillion, an amount that approaches U.S. gross domestic product, in a bid to stem the longest recession since the 1930s. The spending will erode the value of the dollar and boost the appeal of silver and gold as alternative assets, Wheeler said. If you believe any of this, you might want to increase your exposure to silver miners like CDE, SSRI or SLW, although these don’t pay any dividends. Disclosure: I own ERF, CDE, FXA, GDX, EDD, physical gold and silver. Previously I had mentioned several ways to invest for a recession or a major downturn in the US economy. In that post, I stated that one of the ways to hedge against the declining dollar (apart from my favorite method of buying gold) was investing in foreign currencies. Several people emailed me asking how to buy foreign currencies. A few were concerned that they would have to travel overseas and open a foreign bank account. Luckily, it isn’t so difficult. You have 3 choices. 1. Buy Currencyshares ETFs. You can choose between several currencies like Australian Dollar (Ticker: FXA), Swiss Franc (Ticker: FXF), Japanese Yen (Ticker: FXY), Euro (Ticker: FXE), etc. If you have a brokerage account, its as easy as buying stock. This is probably the easiest method. They also pay monthly dividends and are quite similar to buying a foreign currency CD. 2. Open on account with Everbank and invest in their foreign currencies CDs or directly open an account in a foreign currency. 3. Open on account with Interactive Brokers and directly buy foreign currency (this is probably the most hassle so you’re better off sticking with the top 2 methods). If you’re interested in buying foreign stocks, the easiest way is to buy the ADRs (American Depository Receipts). However a lot of foreign stocks do not trade in the US as ADRs. A good way to play the foreign markets is to buy foreign ETFs. For example, if you’d like to buy blue chip dividend paying swiss companies, the Swiss Helvetia Fund (ticker: SWZ) is a great investment. (I also happen to like the Swiss Helvetia Gold Coins too!). If you think Singapore’s economy is doing well, you can buy the iShares Singapore Index ETF (ticker: EWS). Or if you like Brazil, you can buy the iShares Brazil Index (ticker: EWZ). For a more comprehensive list of foreign ETFs check out How To Conquer The World For Fun & Profit. If you’re interested in learning more about currency trading or investing in foreign currencies, I strongly recommend Everbank’s free daily newsletter about the currency markets, the Daily Pfennig. It’s really good. What About LOR-Lazard World Dividend & Income Fund? When I first heard about LOR, I thought it meant Lord of the Rings, but no, the topic was on Lazard World Dividend & Income Fund(LOR). I love your blogs. Please tell me what to think about an odd stock – LOR. They make money from high dividend stocks AND from some sort of forward contracts involving emerging market currencies.They had a 25% yield last year but are extremely volatile ( and I don’t know why!). They have a lot of institutional investors and it looks like a good dividend pick but I don’t understand how reliable the currency contracts are. Could you do an analysis of LOR? I’m not exactly a stock picking expert, but I’ll give it a shot. First of all I looked for LOR on Yahoo! Finance to see what it meant. I got the name of the company, the stock price graph but not much other info. That’s because it’s not a stock, but rather an ETF. Ah ha! That explains the high dividend, since I don’t know of any company that is so generous with their dividends. Accordingly, I headed over to ETFconnect, which is a great site for finding information on ETFs. I see that its in the category of “global equity” which means it invests in world-wide stocks, just the kind of thing you’d expect from its name! The Fund seeks total return through a combination of dividends income and capital appreciation. The Fund may pursue this objective through a world equity strategy and a short-term emerging markets and debt strategy. The Fund may invest substantially all of its net assets in between 60 to 90 world equity securities that are financially productive and high dividend yielding. It seeks to enhance income through exposure to short-term emerging market forward currency contracts and other emerging markets debt instruments, limited to 33.3 percent or less of the total leveraged assets of the Fund, which will provide exposure to emerging market currencies. The first part seems pretty straight-forward, but I’m not too sure what the last part entails. But at least they’re not leveraged 10 to 1 on some Subprime Real-estate Mortgage Backed Securities (RMBS) & Collateralized Debt Obligations (CDOs)! Being overleveraged is what caused Bear Stearns’ Hedge funds to collapse last July. I also see that it’s currently trading at an 8.5% discount to its Net Asset Value (NAV). This means you can buy the basket of its shares for less than what the shares currently trade for! The current dividend yield is reported to be 8.43%. That’s strange because Yahoo! finance reported it to be 25%, a fact that I verified on Google Finance by looking at the distribution in the stock chart. It seems that in addition to the dividends, there were long and short term capital gains distributions in December 2007, which boosted the yield. While this isn’t a bad thing in any way, one shouldn’t buy LOR expecting to see a similar 25% yield in the future. If you’re buying it for the dividend, you should expect to receive 8.5% and be happy with it. The only concern I have is whether or not that dividend is safe. The ETFconnect site informs us that the fund is diversified by invested in the US (35%), th UK(23%) and other countries (42%). While it doesn’t say which other countries, looking at its top holdings we see companies like Taiwan Semiconductor, ENI and Tesltra, so we know its investing in South East Asia, Brazil and Australia. I like that global diversity. It also seems to be diversified across various industries like finance, telecom, energy, materials, consumer staples, and so on. However, from the mix of industries it’s invested in, 32% is in the Financial Sector. That I don’t like at all. Considering that Bank of America, HSBC and Citigroup are also featured in its top holdings, I’d say thats a little to much for me. While the stocks in finance sector are currently rising on the backs of the Fed’s rate cut, I expect this joy to be short lived. And I still haven’t seen any information on its’ currency trading, debt-instrument contract or whatever it was. *The Fund will invest substantially all of its net assets in between 60 to 90 world equity securities that are financially productive and high dividend yielding. *It seeks to enhance income through exposure to short-term, emerging market forward currency contracts and other emerging markets debt instruments (limited to 33.3% or less of the Fund’s total leveraged assets), which will provide exposure to emerging market currencies. These two strategies are complementary, with historically low correlation to one another, which may reduce volatility. There can be no assurance that the Fund will meet its investment objective. But the rest of their site is actually quite informative. We already know that the stock portion of the fund is diversified across various countries, industries and capitalizations so I’ll skip over that part. But we haven’t seen much info on the currency & debt portion. The Fund’s emerging market currency and debt strategy will also be broadly diversified across countries and regions, offering the potential for portfolio diversification- with the possibility of credit and duration protection and limited interest-rate sensitivity. Not really sure how they’re implementing this strategy, but if it works, it would be pretty useful in current economic conditions! They also have an interesting snippet about their dividend strategy too. *Typically, dividends are real earnings, not hoped-for earnings based on the potential, future growth of a stock. They also offer the potential for stable income. *The 2003 tax bill significantly lowered the U.S, tax rate on qualified dividend income of U.S. taxpayers. Investing in companies with a track record of long term dividend growth is a sure fire way to beat the index averages [source: The Future for Investors by Prof. Siegal]. Investing for tax savings is not something I generally consider. First the investment has to make sense. Then you look at the taxes. If you’re so rich that you’re really worried about taxes, then maybe tax-free munies are the best route for you. Finally, there seems to be some information on the currency trading aspects. The Fund’s unique leveraging strategy allows greater flexibility, risk management, and economic efficiency. To enhance the income potential for investors, the Fund intends to employ financial leverage, initially up to approximately 33 1/3% of total assets, by investing in forward currency contracts and/or borrowings. Leveraged assets will be used for investing in emerging market currency or debt instruments. It should be noted though, that the Lazard World Dividend & Income Fund, does not seek to profit from utilizing a leveraged spread-play. That is to say, the Fund is not borrowing at the short-end of the yield curve in order to invest at the longer-end of the yield curve (and profit from the spread). On the contrary, the leveraged portion of the Lazard World Dividend & Income Fund invests in very short duration instruments (typically, less than 12-months), and instead seeks to profit from accessing the high yields available in emerging market local currency debt. Using leverage is a speculative investment technique and involves certain risks. While its commendable that they aren’t borrowing short-term and lending long-term (remember the RMBS & CDOs I mentioned? ), I get the feeling that they’re trying to profit from the carry-trade. Of course, I’m not 100% certain that’s what they’re doing, but it definitely sounds like that to me. With the Swiss franc nearly at parity with the US Dollar and the Yen up 26% in the past year, it strongly looks like the carry-trade is unwinding. In fact, they could start losing money on these kinds of trades. To conclude, I think this is a very interesting fund. I would be amazed if they could continue to deliver 25% annual dividend yields, but 8-9% definitely seems achievable. However, I’d look at ALPINE DYNAMIC DIVIDEND FUND (ADVDX) and even American Capital Strategies (ACAS) before I allocated any funds to LOR. Note, I’m not recommending either of the 2, I’m just saying I’d take a look at them before I made any decision. This week the US Dollar sank to 25 year lows against the Pound, AU/NZ Dollars and other currencies. There’s a saying that money flows to where its treated best. What does that mean? It means people are converting their money into currencies with the highest yields. Yields on the AUD,NZD and South African Rand are quite a bit higher than here in the US. Their economies also seem to be growing faster than the US’ too. SA Central bank Governor Tito Mboweni said last week that interest rates were ‘too low’. The South African Reserve bank raised the benchmark lending rate by 50 basis points on June 7th and may raise them again on Aug. 16. Not surprizingly, the South African Rand is sitting at a six week high. I don’t know if its already too late to the party, but buying foreign currency ETFs or stocks with foreign exposure might not be a bad idea. I’ve done very well with Anglo Amercian (AAUK) and BHP Billinton (BHP). I’ve been selling covered calls on GDX – yes I know selling puts is the same risk-reward ratio but I usually do pretty well in selling far out options. I lost a whopping $40 than if I had outright sold them on friday. I’m hopping we’ll see a small dip in the market next week so I can buy back in at roughly the same price. I’m thinking I might actually buy CEF or SLW (Silver ETF) instead since I think there’s a chance than silver might run up more than gold on a percentage basis this year. The markets closed today, but earlier kitco.com reported that Gold was around $672.00/oz. quite a jump in the past few months. Hopefully it consolidate before resuming its next leg up. My GG naked puts expired worthless so I made $138.50. If they had expired in the money I wouldn’t have felt bad about actually buying the stock.